New for 2016, Cobalt’s CS3 is described as “a complete restyle of the classic 23 footer – a contemporary design with a hint of retro.” At 23’ 8” LOA, this new CS3 is the largest of Cobalt’s four-model Gateway series of bowriders starting at just under 21-feet, all of which ride on an 8’6” beam. The CS3 is one of twenty-nine models from almost 21 to almost 35-feet in six series of bowriders, deck styles, cuddy cabins, cruisers plus the WSS Watersports Series. The “hint of retro” in the CS3’s design is most obviously apparent when viewed from its aft three-quarters. Its sheer line tapers most gracefully and subtlely toward the stern and coupled with the slight concave curve of the transition from hull side to transom, almost leaves the impression of the tumblehome stern look of the classics of yore. In addition, the dual, wide transom walk-thru’s from the swim platform to the cockpit leaves a tapering (both horizontally and vertically) central island sun lounge reminiscent of the raised motor box of the classic wooden runabout. But of course there is absolutely no wood used in the hull construction of this newest modern Cobalt beauty. All structural components are of composite construction with eight layers of hand-laid fibreglass on the hull bottom growing to sixteen at the keel where Kevlar® reinforcement plus further strengthening with Spraycore® plus a Z-Thane™ protective barrier coat completes this gorgeous new hull and deck design, all covered with Cobalt’s ten year hull and deck structural warranty. In true Cobalt tradition, the CS3 comes standard with many features either not even available or not normally found as standard equipment on most competitive models. For instance, at the helm, a composite “eyebrow” with custom stitching protects an etched stainless steel instrument panel from sunlight and weather. Stainless steel switches are standard as is a leather steering wheel with an auto-leveling hub. A bow walk-thru door is standard as is snap-in cockpit carpeting and a flip-up bolster in the helm seat. The low-to-the-water extended swim platform features Cobalt’s unique flip-down centre-mounted swim step and this platform is protected from impact damage with polished stainless steel tubing along its outer edge. Polished stainless steel also trims the windshield header. Hull graphics are molded into the gelcoat as opposed to vinyl add-ons. Bow seating is traditional in layout with port and starboard lounge seating with high-back upholstered and well padded console backrests plus a rearward facing bow bench seat. Recessed stainless steel grab handles are standard as is a bow anchor locker. Under seat storage is provided throughout utilizing Cobalt’s double-knuckled hinges on the seat cushions so they will stay open when accessing this storage. An under-seat removable ice-chest is provided. Additional notable standard equipment includes a ski tow eye plus a Bluetooth compatible sound system with iPod/USB/MP3 port, six speakers plus a dash-mounted remote control. Notable optional equipment includes a bimini top or further opt for the folding aluminum arch in black or white complete with its own bimini. Bow and cockpit tonneaus and a mooring cover are most desirable additions for use in our Canadian climate. 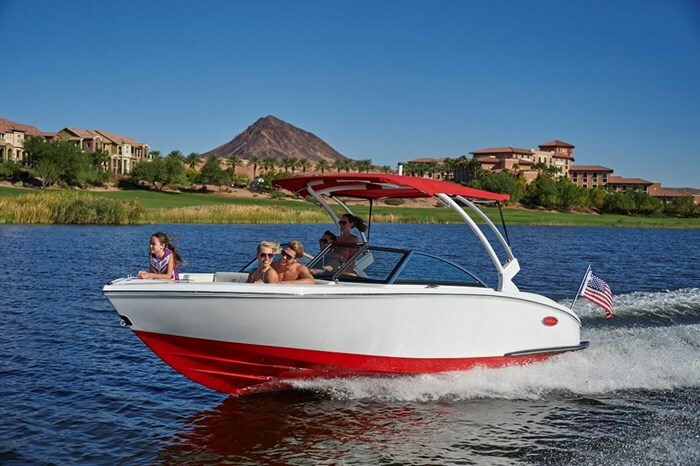 Choose a depth and water/air temperature gauge package, a Garmin 741 Touch-Screen GPS, satellite radio, Premium Sound System with transom remote plus additional speakers if you choose the arch. Filler cushions are available to fill in the walk-thru’s to create U-shaped cockpit seating plus additional fillers to cover the walk-thru’s creating a full-width sunpad plus a bow centre cushion insert. Weighted throw pillows are also available as is a dinette table, a stainless steel foot tread for the helm, docking lights, Sea Grass floor covering, and Cobalt signature fender clips. Lots of exterior and interior lighting options are there for the choosing as are arch-mounted wakeboard racks, a driver’s rear-view mirror, cruise control, battery charger, and an automatic fire extinguishing system. Standard power for the CS3 is your choice of a 250 hp MerCruiser 4.5L MPI ECT with Alpha sterndrive or a 240 hp Volvo V6-240-G with SX sterndrive. Several optional choices from both engine makers up to a maximum 350 hp with B3 or DP sterndrives respectively are available. And to complete that “classic” look, opt for the stainless steel stern-mounted flagpole.